Blog | How is garage perfect for Valentine's Day Celebration? When planning a romantic Valentine’s Day celebration, many overlook one of the best places possible: Their own garage. 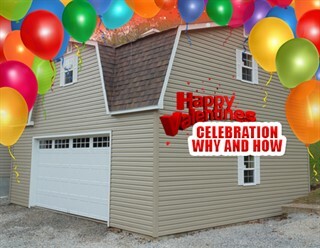 Why is the garage the perfect place to celebrate your love? And how can the space be properly transformed? Part of the reason many go to restaurants is to escape the monotony of dining in the home. We all have a natural need for variety. But strangely, upon returning home, we return to the same routine and the evening becomes less-than-romantic. Here are a few reasons the garage can be the best place for your romantic Valentine’s Day celebration. The key to any romantic gesture is personalization. A roadside fireworks stand once decorated its 4th of July offering with Racing emblems, checkered flags, and similar items. As can be imagined, nearly everyone in that city who was a racing fan went to that stand. We are naturally drawn to things which reflect our interests. All couples have at least some shared interests. So why not incorporate those interests into the décor for the garage. Of course, unlike the rest of the home, the average garage has plenty of hooks and such in the ceiling and sides from which to hang decorations, making it easy not only to set up, but also to take down later. Also, if it is a nice evening, the garage door can be opened so that the two of you can dine in the open air. The best part is that should the weather turn inclement, the garage door can simply be closed and the Valentine’s Day celebration can go on as planned.